"As you start your journey, the first thing you should do is throw away that store-bought map and begin to draw your own." This year seems to be filled with just a smidge more risk-taking, newer adventures, and a fresh-er (is that a word) perspective. In addition to launching the very first magazine for Heartbox Photography (whoo-hoo! ), which I'll talk about more about in a later post, I am excited to now launch into senior photography and get a head start on the class of 2019! And oooooooh, can I just say I LOVE this? 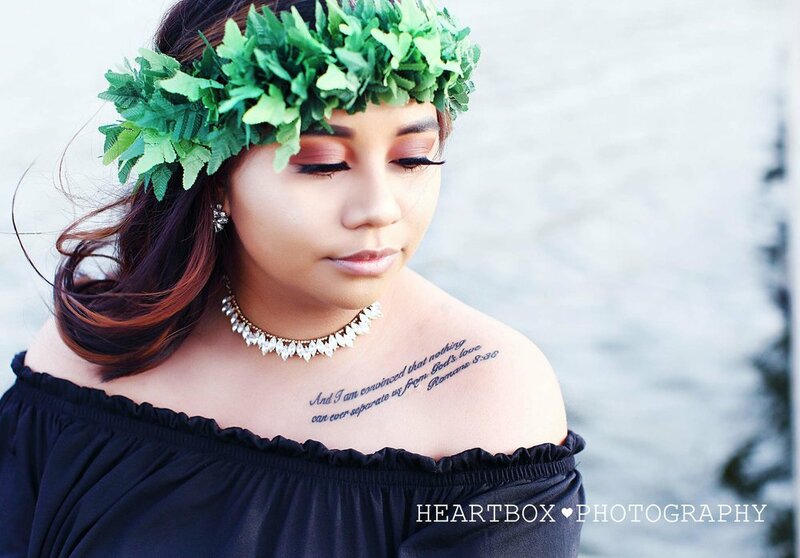 As part of Malia's shoot, she wanted to integrate something that was a nod to her Polynesian background and to her faith - hence the haku headdress and the beautiful tattoo of Romans 8:38. Mix that with a bit of afternoon lighting and I swear even the camera smiled at the result. This is just a sneak peak but stay tuned for more to come!